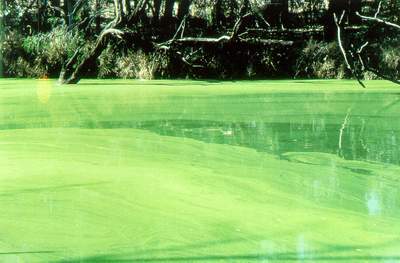 Freshwater blue-green algal blooms can be recognised by a discolouration of the water, by scum on the water surface, or by an earthy or musty odour coming from the water. 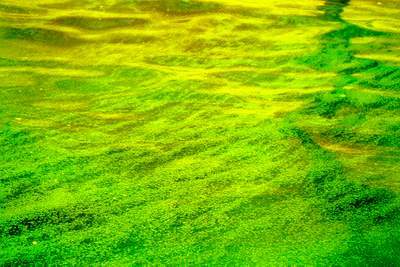 However, algae that are toxic can only be positively identified by an expert. 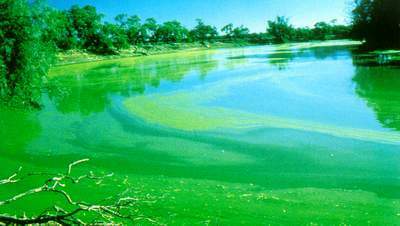 If you think there may be a blue-green algal bloom in a water body, you should contact either the local council or the management authority for the water body, or your local RACC. 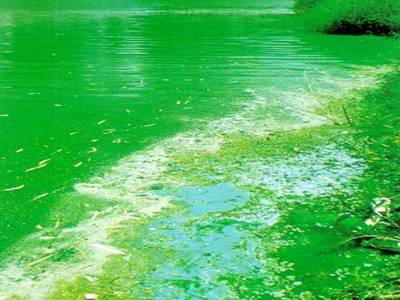 Humans and animals should be advised from drinking or swimming in a water body which is suspected of having an algal bloom. 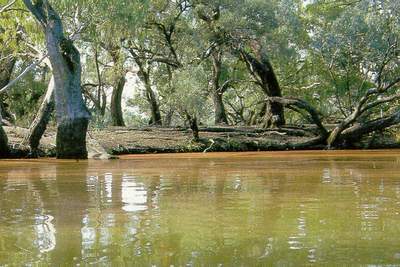 How to report algal blooms and the actions that should be taken by the various agencies are outlined in Regional Algal Contingency Plans available from the RACC Secretariat in your area. To help identify scums and growths, a simple key can be used. 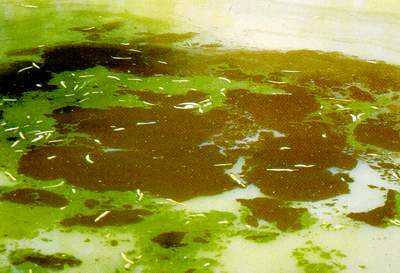 Follow the steps below to find out if the scum is possibly caused by excessive blue-green alga, another alga or by an aquatic plant. It is necessary to go to the surface of the scum to do some simple tests. When using this key, make a choice based on the description, then move to the number indicated at the end of that choice. When no numbers are left and a name to the scum is given, you have identified the scum, provided the correct choices were made. 1. Use a stick to break the scum surface where present and look at the texture. 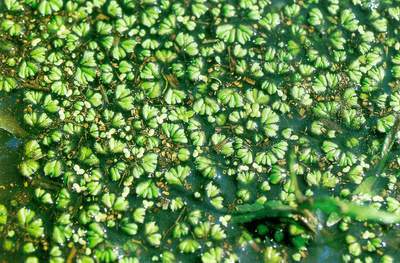 If the scum is composed of many small free-floating plants with or without roots, floating attached plants with roots or algae similar to a flowering plant. Go to 2. 1a. Bloom otherwise. Go to 6. 2. Plant fern-like, free-floating with roots. 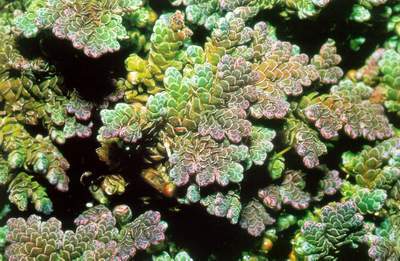 Azolla (Figure 1 and 2). 2b. Plant/algae otherwise. Go to 3. 3. 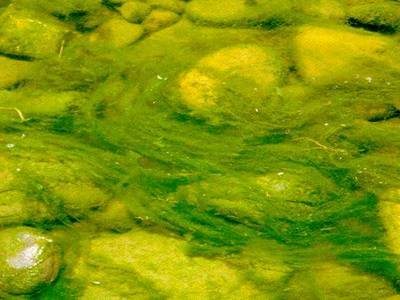 Algae superficially like plant: roots absent and has whorled branches. Go to 4. 3b. Free-floating plant with or without hair-like roots. Go to 5. 4. 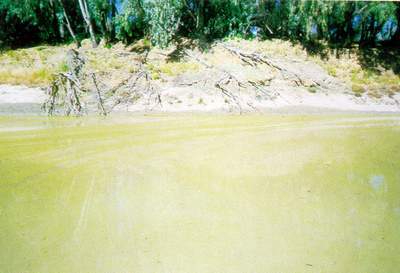 Algae grey-green and secondary branches without whorls of branches. 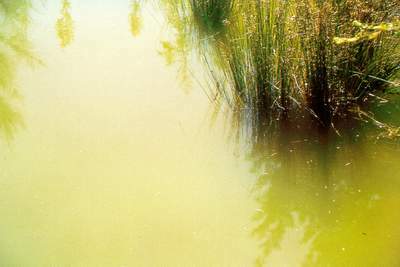 A stonewort (Characeae) of the genus Chara (Muskgrass). Figure 3. 4b. Algae greener in colour and secondary branches with whorls of branches. A stonewort (Characeae) of the genus Nitella. Figure 15. 5. Free-floating plant with or without hair-like roots. Plant small, less than 2 cm long. 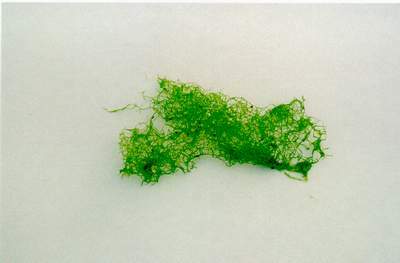 A Duckweed being the genera Lemna, Wolffia or Spirodela (Figure 4). 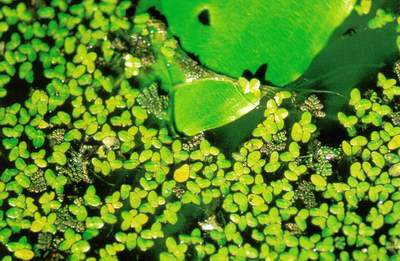 The small leaved Wolffia does not have roots, but is a small plant c. 1 mm in diameter. 5b. Free-floating and differentiated into leaves and stem but not radially symmetrical up to 5 cm in diameter with no roots present. 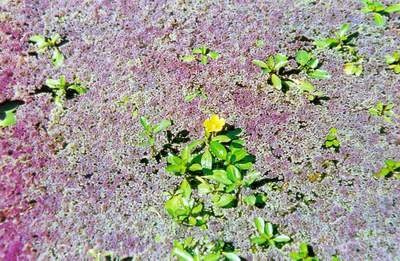 Liverwort (Bryophyte); Riccia or Ricciocarpus. (Figures 5 and 6). 6. Scum composed of strands (filaments) either straight or branched. Go to 7. 6a. Scum otherwise. Go to 9. 7. Filaments green or brown, straight or branched. Go to 8. 7a. 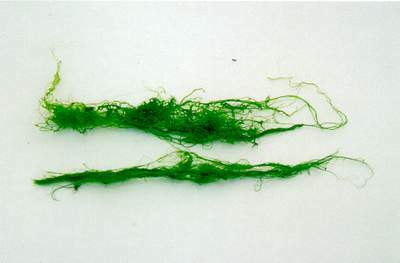 Filaments arranged into a hair-net type pattern, possibly the green alga Hydrodictyon (Figure 7 & 8). Figure 8 (Simon Mitrovic) . 8. 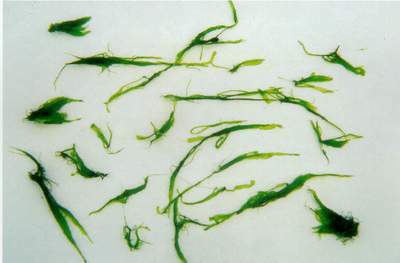 Filaments in a thick mat, green or brown usually branched. 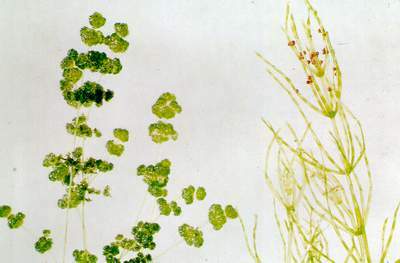 Possibly the green alga Cladophora (Figure 9 and 10) or Enteromorpha (Figure 11). 8a. Filaments green and feel like wet soapy hair, possibly the green alga Spirogyra (Figure 12). 9. Algae one discrete unit, either globular or leaf like: green or brown and not composed of fine filaments or colonies and not paint-like. If broken, it will not reform. 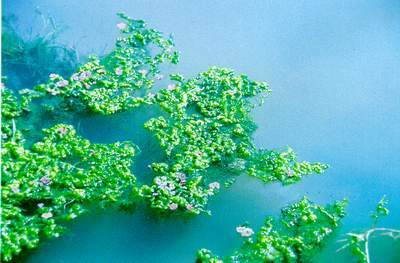 A macro algae (Figure 13). 9a. Bloom otherwise. Go to 10. 10. Bloom with a thick paint-like surface or strong colour to water surface. May be green cloudiness or colour to the water. 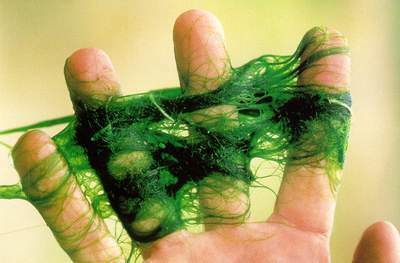 It is not composed of strands or filaments of algae. Go to 11. 10a. Bloom composed of small green, red or brown flecks. May be well spaced or form a thick scum. Go to 13. 11. 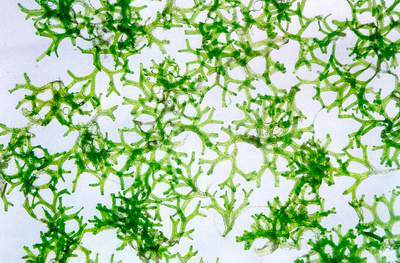 Bloom blue-green or strong green, possibly a blue-green algae, Anabaena or Microcystis (Figures 14 - 18). Figure 17 (Simon Mitrovic) . 11a. Scum otherwise. Go to 12. 12. Bloom khaki or reddish. May be the green alga Chlamydomonas or the Euglenoid Euglena. Clamydomonas is usually khaki. 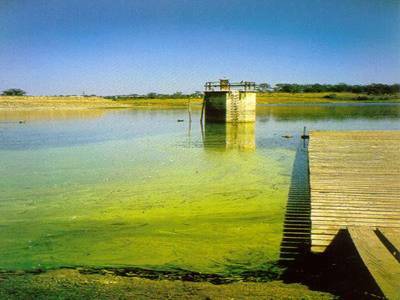 Euglena can be khaki or reddish and this may change during the day. This should still be checked microscopically as it may be a blue-green algae. (Figures 19-22). 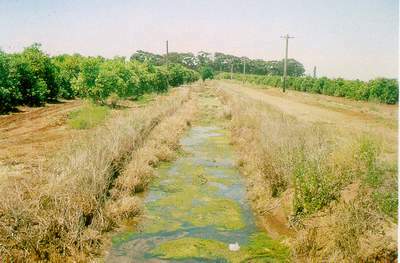 Organic matter can also form scums with algae (Figure 23). 12a. Bloom white, grey, yellow-brown, red or blue. May be a mixture of these colours with some green and/or dark humus-type substances included. 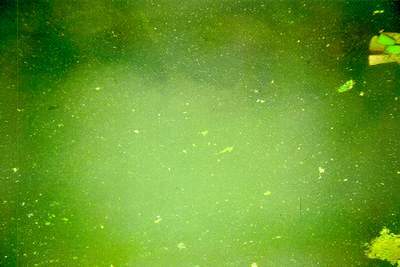 Possibly a blue-green algal scum after photo-oxidation (Figures 15 and 16). 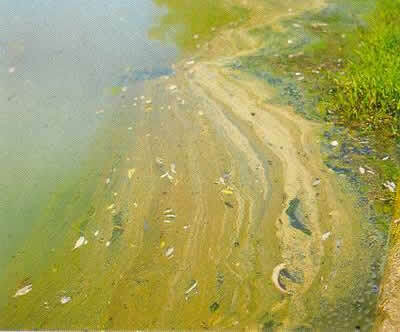 If there is a brown colour to the water it may be a Diatom bloom (Figure 24). Figure 24 (Simon Mitrovic) . 13. Small flecks on the water surface not uniform in size. May be aggregated to cover a large area or well dispersed. 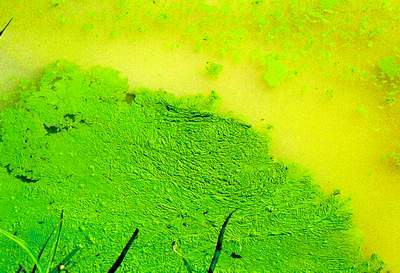 Possibly the blue-green alga Microcystis (Figures 25-26). This key is by no means exhaustive, but includes many blooms likely to be confused as blue-green algae. 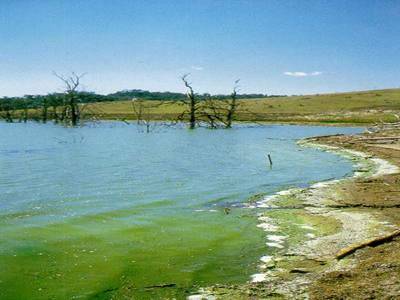 The algae here are generally found in freshwater systems such as lakes, rivers, reservoirs, creeks and ponds.